Yesterday my fish tank needed cleaning, so in between sobbing over photos of my parrot (see previous post) I decided to keep myself busy. I keep a white bucket outside on my porch, which I use for gardening purposes as well as collecting gross fish tank water. I was about to bring it inside when I noticed something unusual. 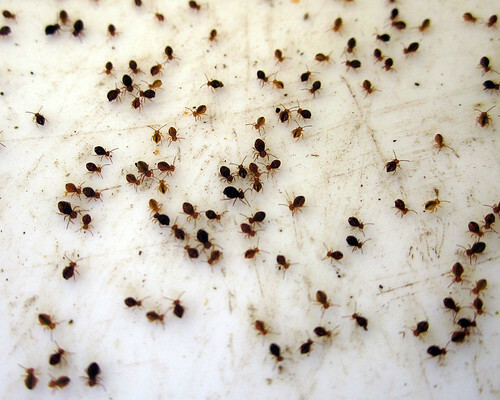 The inside of the bucket was SWARMING with springtails (creatures in the class Collembola, closely related to insects). I took a quick video so you can see the way they were jumping – the effect is rather like popcorn. I shook them onto the ground so I could use the bucket, and watched them crawl and hop towards the garden. Aren’t they adorable? 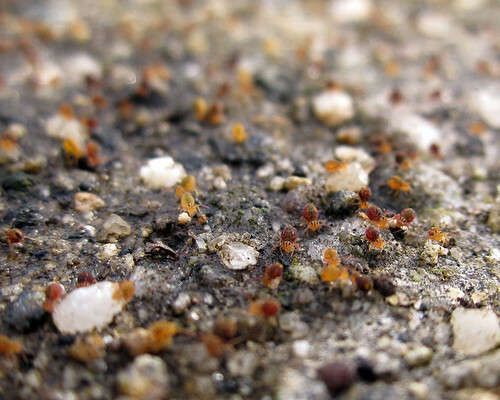 These springtails are in the family Sminthuridae, known as the globular sprintails. I am not sure why they decided to inhabit my overturned bucket in such large numbers (several hundred, at least, perhaps 1000 or more?). Any ideas? Posted on November 27, 2011, in Invertebrates. Bookmark the permalink. 2 Comments. I’ve often seen large aggregations of springtails, especially those associated with fresh water. Some may be nothing more than response to appropriate habitat or a bloom of some especially yummy fungi, but I think some are mating swarms. I’ve seen patches of ground so covered in spermatophores that it looked like it had been overgrown by fungal hyphae. A lot of sminthuroid (now a superfamily – and I can’t tell the families apart) collembolans have interesting mating behaviours. Sminthurides aquaticus has dwarf males with kinks in their antennae that latch on to the female’s antenna. The female lugs around the male face-to-face until he produces his spermatophore. From your top picture it looks like you have two size-classes of sminthuroids, so this may be a mating aggregation.